Always try to contact the creator for permission. Always link to the original artwork and give credits. Never use copyrighted material for commissions. This blog is for the most part a what-if -scenario. My custom covers don’t compete with anyone’s work out there. They’re not taking anything away from anybody. This is me being Oscar Wilde, praising you and your work. Also, my clientele is so ridiculously small that it doesn’t make that much of a difference anyway. And concerning the big labels and their woefully decline of market share, well I think it’s safe to say that there is none such thing. There are more soundtracks releases than ever before and the sales of vinyl records are growing constantly. With a blog like this I’m more likely endorsing and supporting this development. Having said all of this, today’s post is about a custom cover for a soundtrack album that doesn’t even exist. My take on it is purely fictional, one of those what-if’s I was mentioning earlier. 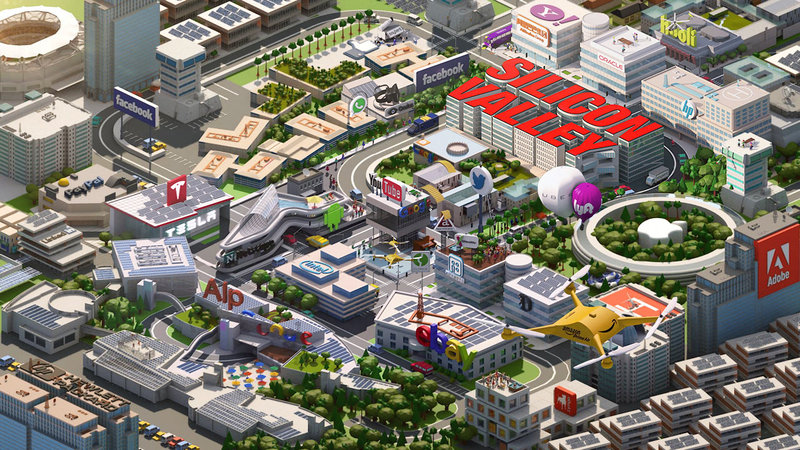 I’ve stumbled upon Silicon Valley during my research for Stranger Things and got immediately hooked on those brilliant opening credits. Oh my god, what a packed cornucopia of creativity! And a perfect opportunity to come up with a new digipack design. I’ve found a suitable screencap from the first season which I enhanced with various elements from subsequent seasons, to make it look contemporary. This “wallpaper” was then applied to and postprocessed into the final design. And I think it looks pretty damn fine! Enjoyable leisure activity for me. Nice viewing experience for my visitors. No damages to any economic interests. Free advertisment to potential buyership.